The first notable change is a bug fix related to 3D Touch. 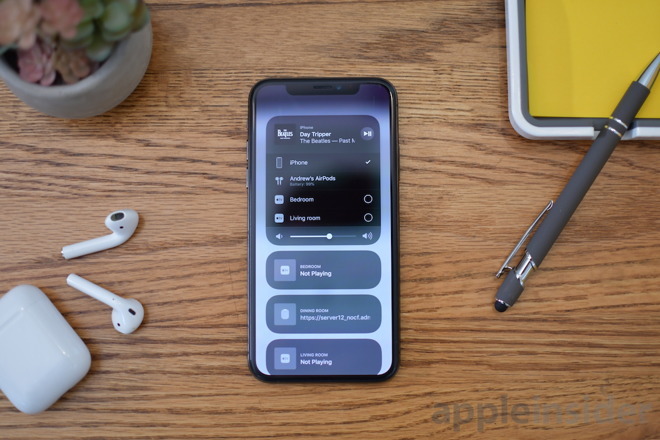 Many users previously reported issues using 3D Touch on the Home screen right after unlocking their device, but it appears to no longer be the case in the latest beta. The second concerns the volume slider inside of Control Center desynchronizing with the device's current volume. Once more, the icon indicates the current volume, with it changing to match the raised or lowered output. Performance-wise, we see no real change between the second and third betas. A benchmark test using GeekBench showed the latest release as being slightly slower from last time, but nothing majorly irregular. Aside from beta-to-beta benchmarks, there is also a degree of variance expected between tests using the same settings, so there is seemingly little to be concerned about here. While changes to battery life under the third beta is as yet unknown, it is unlikely to change. The last few weeks running the second beta showed no noticeable changes to the rate the battery depletes, with an iPhone X running smoothly and lasting practically a full day, as expected. Alongside iOS 11.4 beta three, Apple also released the third betas of macOS 10.13.5, tvOS 11.4, and watchOS 4.3.1. Be sure to check out what was new in iOS 11.4 beta two.